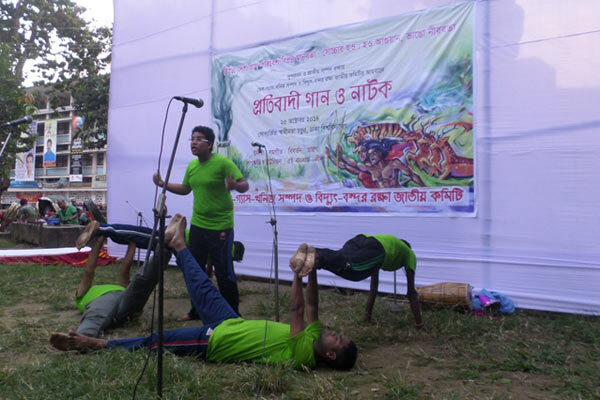 Over the weekend, Bangladeshi artists performed plays, sang songs, and recited poetry all in a bid to protect the Sundarbans—the world’s biggest mangrove forest—from the threat of a massive coal plant. Construction is already under way on the hugely controversial Rampal coal plant, a 1,320 megawatt plant set just 14 kilometers from the edge of the Sundarbans. “We have many alternatives to produce electricity but no alternative to Sundarbans,” said Anu Muhammad at the cultural protest. A renowned economist at Jahangirnagar University, Muhammad is also the secretary of the National Committee to Protect Oil, Gas, Mineral Resources, Power and Ports, which organized the protest. Critics of the Rampal coal plant fear that pollution from transporting and burning the coal will degrade the Sundarbans air and water. Moreover, they say that the coal plant’s massive water demands—9,150 cubic meters of water every hour—could decrease water levels on the Passur River and change the delicate balance of salt and freshwater that the mangrove forest depends on. Wildlife could be at risk as well. A biodiversity hotspots, the Sundarbans is home to hundreds of species, including a significant population of Bengal tigers (Panthera tigris tigris) as well as Ganges river dolphins (Platanista gangetica) and Irrawaddy dolphins (Orcaella brevirostris). Moreover, mangroves provide essential nurseries for many fish species. 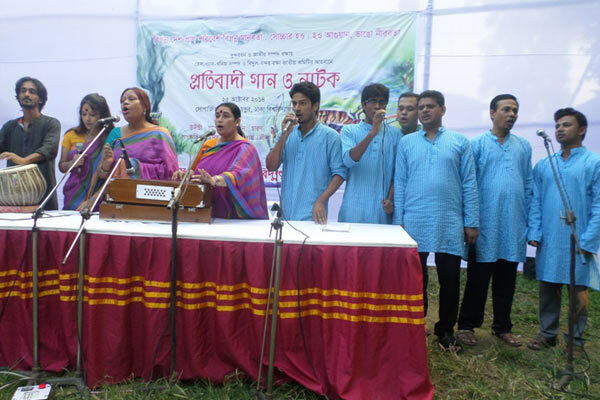 Singers perform at the cultural protest for the Sundarbans. Photo courtesy of the National Committee to Protect Oil, Gas, Mineral Resources, Power and Ports. The plant has already faced major protests, including a five day march last year that attracted over 20,000 people by its end. But this time, activists turned to cultural icons. Rahman told mongabay.com that construction of the Rampal coal plant is in “full swing” despite numerous protests. Earlier this year, protestors said they were attacked by members of the ruling party—the Awami League—and had cameras and mobile phones stolen when they attempted to visit the site of the coal plant. The Rampal coal plant is being built by the Bangladesh Power Development Board and India’s state-owned National Thermal Power Corporation (NTPC). Although the NTPC is fronting only 15 percent of the costs, the energy produced will be split fifty-fifty between Bangladesh and India. Performers at the cultural protest for the Sundarbans. Photo courtesy of the National Committee to Protect Oil, Gas, Mineral Resources, Power and Ports. The coal plant is a part of a recent run towards coal-fired power in Bangladesh. This, despite the fact that Bangladesh is consistently rated one of the world’s most vulnerable countries to global warming and often chastises rich nations in climate negotiations for not doing enough. The Bangladeshi government plans to produce 15,000 megawatts of coal energy by 2030, a coal spree that could potentially raise the country’s carbon dioxide emissions by 160 percent. The push is a part of the government’s efforts to bring power to an energy-starved population. Only around half of Bangladeshis has access to electricity. However, critics say there are numerous alternatives to coal power for a country that is being swamped by sea level rise. The Sundarbans provides huge economic benefits to many locals, including forestry, honey, agriculture, and fisheries. Still, the forest may be most important as Bangladesh’s best defense against tropical storms and rising seas. 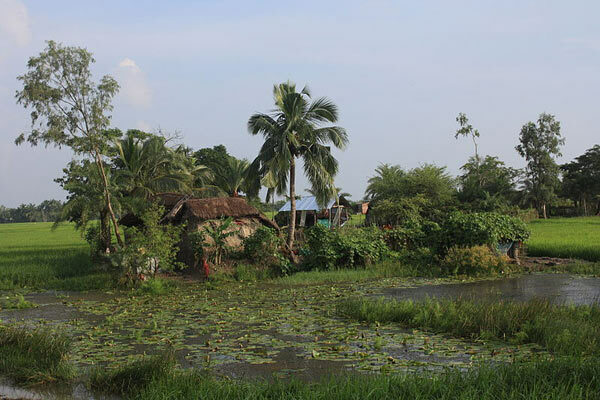 House and small farm on an island in the Sundarbans. Photo by: Arne Hückelheim/Creative Commons 3.0.